Dr. Dieuzaide was honoured to be member of the jury for the scientific books at the time of X° LIVING ROOM OF the placé BOOK under the aegis of the Academy of the floral games in Toulouse. This day it was the handing-over of the price of the novel, of the book of history, the scientific book and the book of poetry. Congratulations with all the award-winnings, members of the jury and large a thank you with Monsieur Francis Grass who offered on behalf of Mister Maire Jean-Luc Moudenc, the medal of Toulouse engraved in the name of the award-winnings. 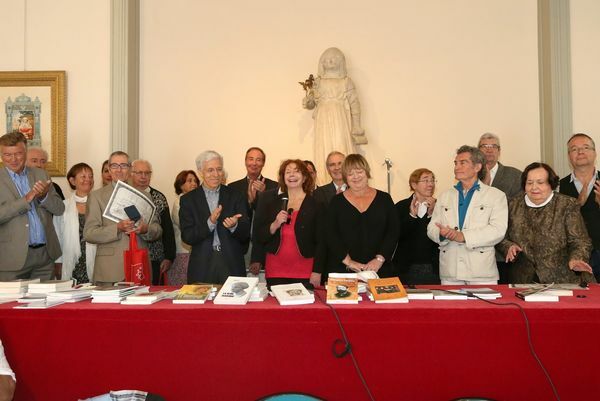 The whole of the award-winnings and members of the jury as well as the deputy mayor Francis Grass and Madam the deputy Martine Martinel Cheer in Sylvie Vauclair, astrophysicist for her book “Dialogues with the universe” with the editions Odile Jacob, which received the first prize. Congratulations with Georges Bringuier for his book: “Alexandre Grothendieck – route of a mathematician except standards” with the Privat editions, which received the second prize. And congratulations for the Special price of the decreed jury with Michel Sicard, geneticist, for his book “Geneticist, why not?” with the editions the harmattan.